If you're talented with a sewing machine, it may be time to combine your new year fitness goals with some creative stitching, and whip up the workout and yoga gear you need to look and feel great at the studio or gym. Making your own yoga gear means you'll finally be able to choose your favorite colors, instead of being stuck with the glow-in-the-dark highlighter shades that seem to fill the racks at most shops. And finding patterns isn't difficult, but unless you've made workout wear before, it can be hard to know what makes a great fabric for yoga wear. Pick the wrong material, and you'll discover that the beautiful tops and bottoms you made bind you in Down-facing Dog or pinch in Warrior One...or even worse, come apart at the seams on your first inverted pose. So what does work for yoga wear? Here are some things to look for when you go shopping for that rich blue, cheerful pink or classic black material you've always wanted for your workout look. Of course it does, you say! But that means your fabric choices also need to stretch, and then snap back into shape as you change positions. To maximize comfort and appearance, look for a material with 4-way stretch. That way, your new outfit will move smoothly with you no matter where you are in the routine. A fabric which combines cotton, with spandex, nylon, polyester, or another forgiving, lightweight synthetic synthetic material will usually give you the stretch you need without excessive weight. If your gym or yoga studio is a bit on the chilly side, you might want to look for a stretchy material with a brushed back fleecy back and smooth face. These fabrics will give you a sleek look, while keeping you cozy as leggings or pullovers. Even if your studio is comfortably warm, adding a fleece-lined fabric to your project might boost the impact of your workout...think of them as portable hot yoga no matter where you practice. Just make sure you don't sacrifice stretchiness for warmth...you'll need both for the best yoga wear construction. People who have never done a full yoga flow might think it's easy, but those of us who do it regularly know that yoga is 1) a lot harder than it looks and 2) sweaty work. And that's even without the hot yoga trend. The sweaty part is why the best choices in material are breathable to keep you cooler and more comfortable. Commercial attire is often cheaply made of all synthetics, which looks colorful and costs less, but traps the heat and sweat in. Making your own outfits means you can skip this, er, um, sticky issue, without spending a fortune on trendy brands. New advances in plant-based materials include renewable, environmentally friendly choices like bamboo and cotton blends. 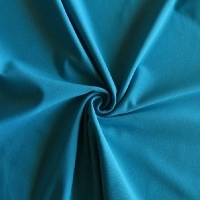 These stretchy fabrics which typically include just enough Spandex to provide the 4-way give you need for yoga, pilates and other studio work, while minimizing the use of synthetics. While these innovative blends may cost a bit more per yard, the comfort and durability allow you to create long-last tops, pants and jackets that are destined to become favorites. When you're choosing your fabrics, make sure your thread and other notions match the stretchiness and give of the material. Using a thread without give will result in tears or pinching as you move through your asanas -- your hard work and creative is too important to lose to the wrong thread or zippers.